Jonathan Gold, Los Angeles Times restaurant critic and Pulitzer-prize winning food writer, has passed away at 57. Our deepest condolences to his family, loved ones, coworkers, and colleagues. Here food editor Garrett Snyder recalls Mr. Gold’s profound influence on his own work and the city’s journalistic community. The first real job I had in journalism, six or so years ago, was as a staff writer at the L.A. Weekly food section. I remember spending my inaugural week of employment, newly blessed with access to a Xerox machine, printing out stacks upon stacks of Jonathan Gold’s restaurant reviews from old issues and digital archives. I pored over them like they were Talmudic texts, pinning them to my cubicle wall and circling phrases that leaped out for their brilliance and incisiveness. There was the review where he framed the firm no-ketchup policy at Sang Yoon’s recently debuted Father’s Office as an extended metaphor for “Bush-era America,” or the one where he detailed the nuanced elegance of Nanjing-style salted duck at a specialist in San Gabriel. This was how to write about food I lectured myself, this is how a writer tells stories. Of course, I wasn’t alone in my obsession. Every journalist in L.A. labors in the shadow of Jonathan Gold. Through writing about food, and more importantly the people who cooked that food, he was able to capture the complexity of a city that confounds as much as it exhilarates, each recommendation a gentle nudge pushing the reader toward the unknown and unexplored. He was an ardent champion of the unsung and marginalized, giving serious critical consideration to mom-and-pops and hole-in-the-walls before it was a widespread practice. It was not a cosmic coincidence, I’ve always thought, that Gold’s Counter Intelligence column moved to the Los Angeles Times in 1990, a few years before the city’s long-simmering racial and economic divisions finally ruptured into the infamous L.A. Riots. By vividly chronicling South Central rib joints and Boyle Heights burrito stands, Mr. Gold’s raison d’être was showing L.A. to itself precisely at a time when many were uneasy about venturing beyond their own neighborhood. He pulled back the curtain. That alone was worth a Pulitzer. In the ensuing years, from his reign as L.A. Weekly’s critic to his eventual move to the Times, Mr. Gold grew into the paterfamilias of L.A.’s broad culinary scene. He motivated chefs as much as reviewed them; he inspired a generation of hungry food writers (myself included), and as a national figure he was a civic booster on par with Eli Broad and Magic Johnson. Most importantly, though, his work was always an extreme pleasure to read. Whether it was bowls of fatty tonkotsu ramen, banana-leaf-wrapped Guatemalan tamales, or Indonesian gado-gado, he exalted in his chosen beat with rare delight in a way that democratized not just food criticism, but the sum experience of eating. It is no hyperbole to say there will never be another food writer like Jonathan Gold. His vast array of knowledge, his generosity in fostering talent, his skill in crafting prose that was both enlightening and intimate—they all serve as wild aspirations for anyone working in this industry. On the rare occasions in which I revisit some of the first stories I wrote for the Weekly, I physically cringe at how blatantly I was trying to emulate Mr. Gold’s idiosyncratic style. I’m sure I’m not alone in that regard either. His witty, flowing, pop-savvy voice was quick to pull you in and put you at ease. It felt so effortless, even though I’m sure he fussed and fidgeted over the right words as much as we all do. Straining at those clippings I surrounded myself with years ago, I realize now, was a reminder. There was everyone else, and then there was Jonathan Gold. What makes the loss of our most formidable critic and cultural ambassador all the more heartbreaking is that L.A.—the most exciting place to eat in America, a title that Mr. Gold helped bring to fruition—is more ripe for his commentary than it ever has been before. His writing about the cooking of immigrants and their children is more vital than it’s ever been. It has been left to us then, as Angelenos, to uphold his staggering legacy. As journalists, it’s a chance to dig deeper and explore and feed our intrinsic curiosity in the process. As diners, it’s an opportunity to drive a little further to the taco spot you’ve always wondered about, or to order those spicy crawfish noodles that slightly unnerve you. 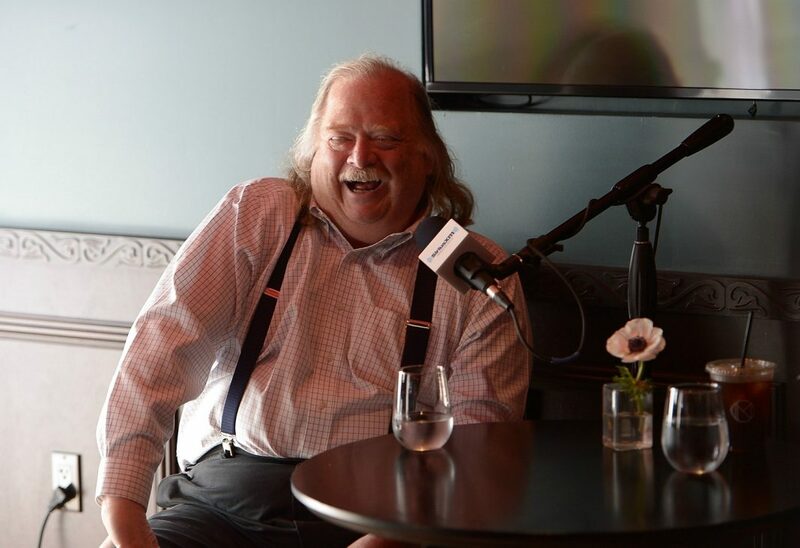 The legacy that Jonathan Gold leaves behind—more than his virtuosic words or his exceptional palate—is to celebrate the splendid cultural kaleidoscope of tastes, sights, and sounds that is modern Los Angeles. Let’s make sure that always lives on. Next articleWhere to Find the Prettiest Pendant Lighting in L.A.